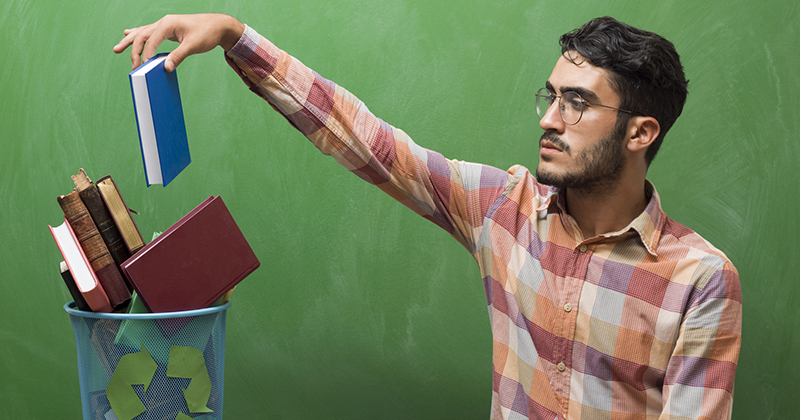 The same proportion of teachers are now entering the profession as leaving it. The number of full-time, qualified teachers entering teaching in state schools has fallen since 2015, from 45,500 (10.5 per cent of all existing and new teachers) to 42,430 (9.9 per cent) in 2017. 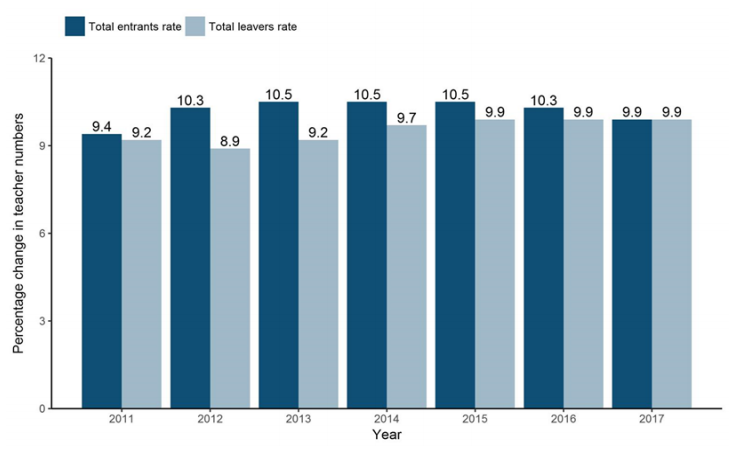 Over the same period the total number of teachers leaving the profession has stayed consistent at 9.9 per cent, with 42,830 teachers exiting in 2017. Part-time teachers are also leaving at a higher rate than those who are full time. The total number of teachers in all schools has fallen by 1.2 per cent, from 457,200 to 451,900 between 2016 and 2017. Before this numbers has been rising slowly since 2011, when the total number of full-time teachers was 440,000. At nursery and primary level the drop between 2016 and 2017 was 0.6 per cent, from just over 222,400 to 221,100. Similarly, secondary teacher numbers fell by 1.9 per cent, from 208,200 in 2016 to 204,200 in 2017. 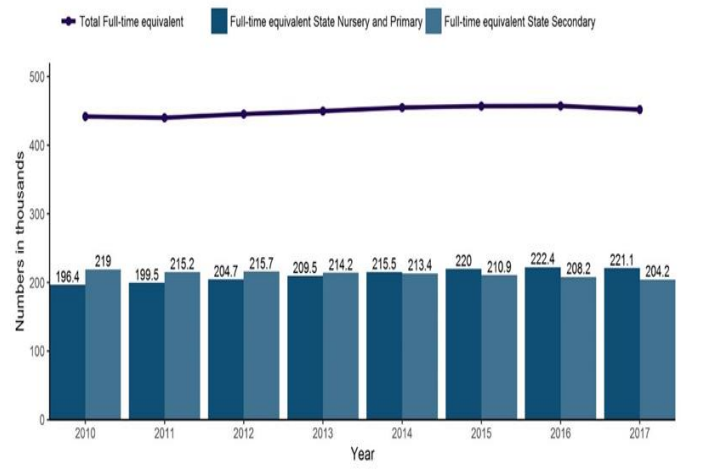 Although the rate of increase in nursery and primary pupil numbers has been slowing and is due to stabilise in 2019, secondary pupil numbers have been rising. Numbers are projected to continue to increase until 2025, as the pupil bulge continues to move through the system. In 2017, the average salary for all full-time teachers in state funded schools was £38,700 – an increase of £300 from 2016. Including part-time classroom teachers this fell to £35,400. The average salary for classroom teachers working in maintained nursery and primary schools was £34,300, compared with £32,600 for equivalent teachers at primary academy schools. In LA maintained secondary schools the average salary was £38,000 compared with £36,500 for equivalent teachers in secondary academy schools. For senior leaders the gap was smaller – the average wage in LA secondary schools was £63,700, against £63,600 for equivalent teachers in secondary academies. The great majority of teachers (98.6 per cent) still hold qualifications at degree level or higher. Numbers have risen very slightly since 2016 when the equivalent figure was 98.5 per cent. The percentage of teachers with relevant qualifications for the subjects they teach increased for 14 subjects last year, but decreased for 13 other subjects. Ebacc subjects seeing an increase in teachers with relevant qualifications were maths, geography, French, German, other modern languages, while those with a decrease were English, physics, chemistry, biology, general science, other science, history, and Spanish.